MARION, Ill. – The Southern Illinois Miners have re-signed right-handed pitcher Chris Little for the 2008 season. Little went 8-8 with a 3.80 ERA in 2007 as he split time between the Miners and the Gateway Grizzlies. The St. Louis native is entering his seventh season of professional baseball. He joined the Miners in late July when he was traded for left-handed pitcher Brian Logan, who is now with the White Sox organization. In nine appearances with the Miners, eight of them starts, he went 4-5 with a 4.44 ERA. He did not allow an earned run in his final 16.1 innings of the season. Included in that stretch was a complete game three-hit shutout. Little was originally drafted by the Houston Astros in the 12th round of the 2001 draft. He spent one season in the Astros organization before signing with Gateway. He then pitched one season with the Montreal Expos affiliate in Vermont before rejoining the Grizzlies for two more seasons. Part 1 of getting to know the team. Thank you Drew for taking the time to anwser my questions. I look forward to interviewing as many of the Miners Player's as possible. Do you have a family, i.e wife, children, ect.? No wife or kids. I do have a dog though. He is a year and a half old Brittany Spaniel. He is an awesome hunter and hopefully a field champion some day. How long have you played baseball? 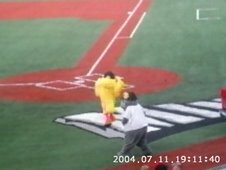 I got into competitive baseball when I was 12. I was actually big into basketball before that. Have you ever had any major injuires? I have had wrist surgery, shoulder surgery, and knee surgery. I am also recovering from a badly sprained ankle. I guess thats what I get for thinking I am Michael Jordan. 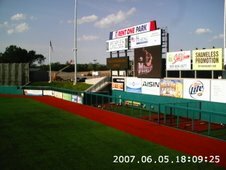 What are your Minor league professional stats? I am not really sure. I do know it wasn't enough at-bats, thanks Orioles! What are you hobbies? I love to workout. I go to the gym five to six times a week and do not miss a day. I am also a big hunter, mainly deer and pheasants. Oh yeah, and I am also a HUGE Utah Jazz and Cleveland Browns fan. What TV shows do you watch? I don't watch tv at all. Actually I don't even have cable. If the Jazz or Browns are on I will go to a bar and grill to watch the game. Whats your favorite food? I eat extremly healthy in the off season, and try to as much as possible in season. Alot of fish, chicken, rice and vegetables. What do you do in the offseason? Work with little league teams and give private hitting lessons. What makes you better than the guy beside you? Nothing, he is my best friend. I don't think I am better than anyone,unless you challenge me in a sport or game. 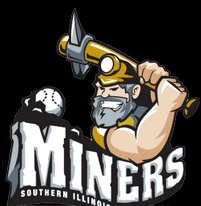 MARION, Ill. – The Southern Illinois Miners have re-signed centerfielder Kevin Koski for the 2008 season. 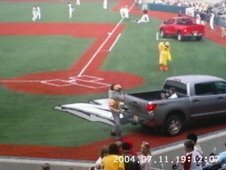 The former Southern Illinois Saluki hit .297 as a rookie with the Miners in 2007, but after 25 games his season was cut short when he broke his hamate (wrist) bone in July. He underwent season-ending surgery. While at SIU, Koski was a team captain and set a school record with a 36-game hitting streak that stretched over the 2005 and 2006 seasons. Over his four-year college career, Koski hit .319 and stole 55 bases. While in college, he was named “best pure hitter,” “fastest runner” and “best plate discipline” in the Missouri Valley Conference by Baseball America. He also won first team All-MVC honors. MARION, Ill. – The Southern Illinois Miners and Clear Channel Radio have renewed a deal that will have all 96 Miners games broadcast live on WQUL-FM 97.7 The Bear for the second year in a row. Radio announcer Scott Gierman will call the play-by-play for every game as well as host the pre-game and post-game shows. It will be his first season as the voice of the Miners. Miners fans can pick up The Bear on their radios from Franklin, Hamilton, Jackson, Jefferson, Johnson, Perry, Saline, and Williamson Counties. 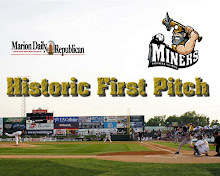 The Miners open the season on the radio against the Gateway Grizzlies on May 21. 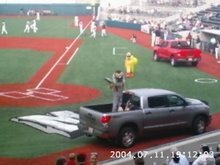 The home opener is scheduled for Saturday, May 24 at 7:05 p.m. For the latest Miners news and updates, visit www.southernillinoisminers.com. 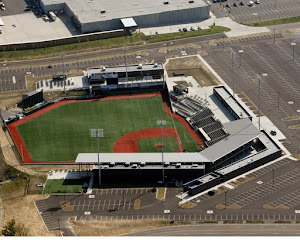 MARION, Ill. – The Southern Illinois Miners strengthened the right side of the infield this week. 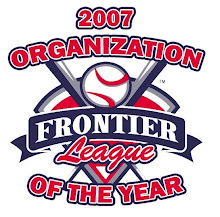 The Miners re-signed first baseman Joey Metropoulos for the 2008 season and acquired second baseman Jason Diaz from the Schaumburg Flyers of the Northern League in exchange for a player to be named later. Metropolous hit .326 with 11 doubles, nine home runs and 32 RBI in only 39 games with the Miners in 2007. He joined the team in late July following his release from the Lansing Lugnuts, the Single-A affiliate of the Toronto Blue Jays. Metropoulos started off strong with the Miners as he recorded a hit in 11 of his first 12 games and hit two home runs in his first week with the team. The former USC Trojan really caught fire as the season ended, finishing the year on a 10-game hit streak. During that stretch he hit .475 with five home runs and 21 RBI and raised his season average from .250 to .326. 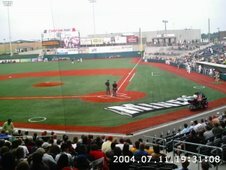 Although he was only with the team for the final six weeks of the season, Metropoulos hit seven home runs at Rent One Park, more than anyone else. In 2007 Diaz spent his rookie season playing second base with the San Angelo Colts of the United League. The left-handed hitting Diaz hit .290 with 5 doubles and 12 RBI in 34 games. 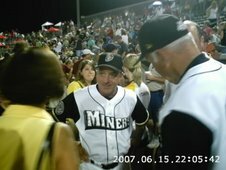 The Miners were left with an opening at second base since 2007 all-star second baseball Ralph Santana retired to become a coach with the Miners when he surpassed the Frontier League’s age limit of 27 following last season. Jason played his college baseball at Texas Wesleyan University where he led the team in hitting with a .390 batting average. He also stole 39 bases in 43 attempts. He earned first team All-Red River Athletic Conference honors and was named Player of the Week on two occasions. The Southern Illinois Miners have acquired the rights to former John A. Logan College first baseman/designated hitter Eric Allen from the Edinberg (Texas) Coyotes of the United Baseball League (UBL) in exchange for a player to be named later. The acquisition of Allen will add another left-handed bat to the roster. Allen hit .313 in 2007 with three home runs and 31 RBI and a .406 on base percentage in 66 games split between the Coyotes and the San Angelo Colts, both of the UBL. He was originally signed by the Miners following the team’s first free agent tryout in 2007. However, with the Miners overabundance of first basemen in spring training last season, Pinto helped Allen catch on with San Angelo thanks to his friendship with Manager Doc Edwards. Allen played at JALC during the 2001 and 2002 seasons and was part of the team that made it to the 2002 Junior College World Series. Over two seasons, Allen hit a combined .395 with 27 doubles, 2 triples, 20 home runs and 96 RBI. 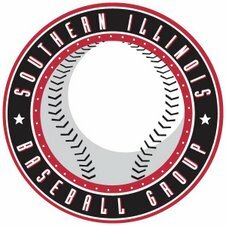 MARION, Ill. – The Southern Illinois Miners will have two important arms back next year as they have re-signed pitchers Travis Hope and Nick Tisone for the 2008 season. “These are two great returning pitchers on our roster for the 2008 season,” Miners Manager Mike Pinto said. Hope joined the Miners as a starting pitcher in 2007 but quickly settled into the closer role following an early season injury to Jason Adams. Hope was nearly unhittable in the second half of the season as he allowed just one run in 28.1 innings of work after the all-star break. During that stretch he recorded nine saves and posted an ERA of 0.32. He finished the year with a franchise best 14 saves and a 1.61 ERA. He held opposing hitters to a .194 average in the second half and a .235 average overall. A native of Marion, Hope played high school ball at Marion High School before signing with the New York Mets. In three seasons with the Mets organization, Hope went 11-5 with a 3.73 ERA. Tisone led the team in wins (eight), starts (19), innings (127.1) and strikeouts (79) in 2007. He also came within four outs of a perfect game when he threw a one-hit shutout against the Traverse City Beach Bums on July 29. His only base runner in that game came on an eighth inning broken bat single. Before joining the Miners, Tisone spent two seasons in the Atlanta Braves minor league system. In 42 games, only three of them starts, Tisone posted a combined record of 6-5 with a 3.56 ERA with four Braves affiliates. Hope and Tisone join shortstop Mike Scanzano as the first players to re-sign from the inaugural 2007 season. Click here or copy and paste this to go directly to Mike Scanzano's Jersey. Milner, a 6-foot-2-inch, 220-pound catcher played last season for the Regensburg Legionaires of the German Professional League where he hit .410 and helped lead the Legionaires to the final game of the league’s championship. He began his college baseball at Mendocino (Calif.) College and later transferred to Bethany (Calif.) University. While at Mendocino, he led the team in hitting with a .374 average and was a first team All-Big Valley Conference selection two consecutive seasons. Beau comes highly recommended by a friend who is a former major league scouting director,” Miners Manager Mike Pinto said. “(Miners Coach) Bart Zeller had a chance to work him out last week as well and saw the same thing I had in two other scouting reports. Beau has a plus arm behind the plate, can generate some bat speed and has some power. He will be a good addition to bring to spring training.”Ninfo played the last two years at Newman University in Wichita where he hit .388 in conference play. In 2006 he helped turn a team record 49 double plays for the Newman Jets. That year he helped lead the Jets to the Midlands Collegiate Athletic Conference championship. Ninfo played the last two years at Newman University in Wichita where he hit .388 in conference play. In 2006 he helped turn a team record 49 double plays for the Newman Jets. That year he helped lead the Jets to the Midlands Collegiate Athletic Conference championship. He also played the last two summers for the Crestwood Panthers who finished third in the National Baseball Congress World Series in both years. In 2006, he won the award for the Most Spectacular Play of the World Series. Ninfo began his college career at Los Angeles Valley Community College where he also won a conference championship. 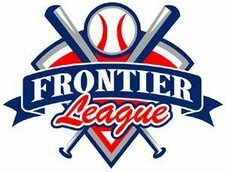 All of the Miners signings are scheduled to report to spring training in Marion during the first week of May.“Mike has done a great job filling in the gaps in our roster this off-season,” Miners General Manager Tim Arseneau said. “I’m looking forward to seeing these guys in May.” The Miners home opener is scheduled for Saturday, May 24 at 7:05 p.m.